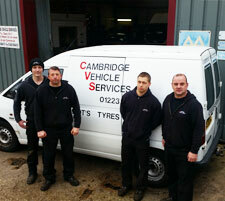 If you are looking for a well established, trustworthy and competitively priced car service in the Cambridgeshire area then you need look no further than Cambridge Vehicle Services. Offering a complete range of car, van, light vehicle and motor home services we cover everything from cambelts to welding, and everything in between! With free quotations, independent prices, a reliable and honest service and even free parking it's easy to see why we have gained such a great reputation for car service and car repairs. We welcome fleet work, as we are already contractors for servicing and repairs for a number of local business fleets. We cover a wide range of services including MOT tests for cars, light vehicles and motorhomes (class 4 and 7), servicing of all vehicle types, general repairs, performance work (tuning and modifying) and even vehicle diagnostics at our garage. As listed above we are one of the few garages in Cambridgeshire that undertake motorhome servicing and repairs, having gained a vast amount of experience in this over the years. With a four bays we are able to accommodate multiple vehicle types, simply call us today on 01223 566 475 to book your vehicle in. Book your vehicle in for an appointment today - simply call us on 01223 566 475 or use the enquiry form as located on this page, and we will quickly get back to you. Join us on Facebook by 'liking us' at this link.